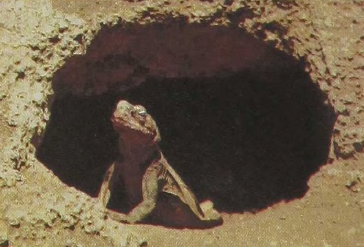 This lizard of rocky deserts is spectacularly adapted for survival in the dry environments of the southwestern United States. 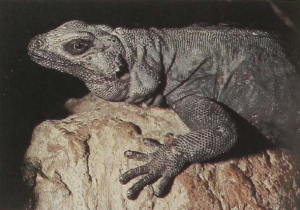 Not only does the Chuckwalla have a highly impervious skin that loses little water in respiration, but it also has water sacs beneath the skin that provide storage from times when water-rich vegetation is available. Chuckwal- las comfortably survive temperatures of 45°C (113°F), which would be fatal for most mammals, including man. When threatened, this lizard wedges itself into rock crevices and then inflates the body with air so that it cannot be pulled out until it relaxes. Chuckwallas feed mainly on plant materials, though juveniles take small insects as well. A large specimen of this lizard can reach 18 inches.